Now we can start our HelloWorld project. We can choose the components we want in our app amoung mobile front, web front and back-end. You need to use Angular2 to create an app with Ionic2, but you don’t need any Angular2 knowledge for this Hello World. It works the same way with an other template. The structure of your future projects depends on the template you choose. 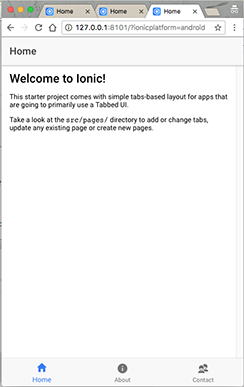 For our mobile Hello World, we just need a mobile front-end, with the Ionic2 blank template. HelloWorldMobile: where you can access your solution settings, logs and directory. 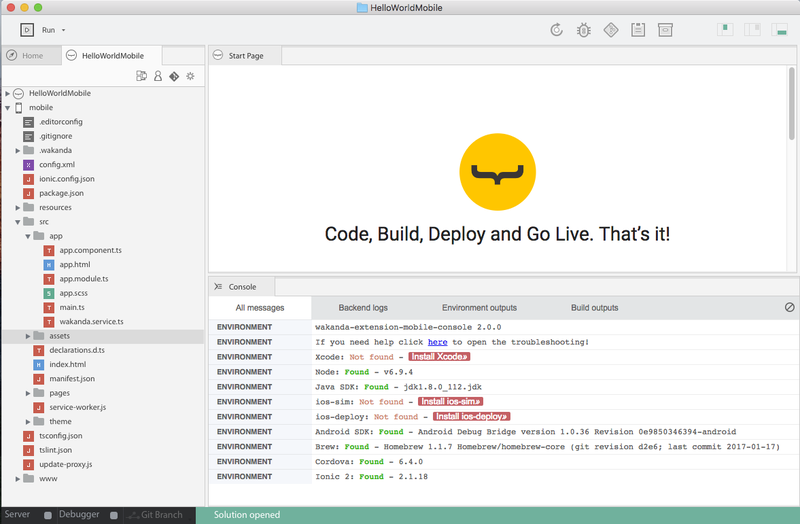 Mobile: where you’ll find all your front-end files to develop and build your mobile app. Mobile apps are based on AngularJS, Ionic and Cordova. For mobile apps, you need to check for any missing dependencies. 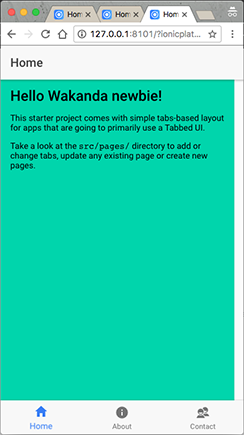 Go in the main menu (Help > Wakanda Troubleshooting) and choose Mobile and then Android. 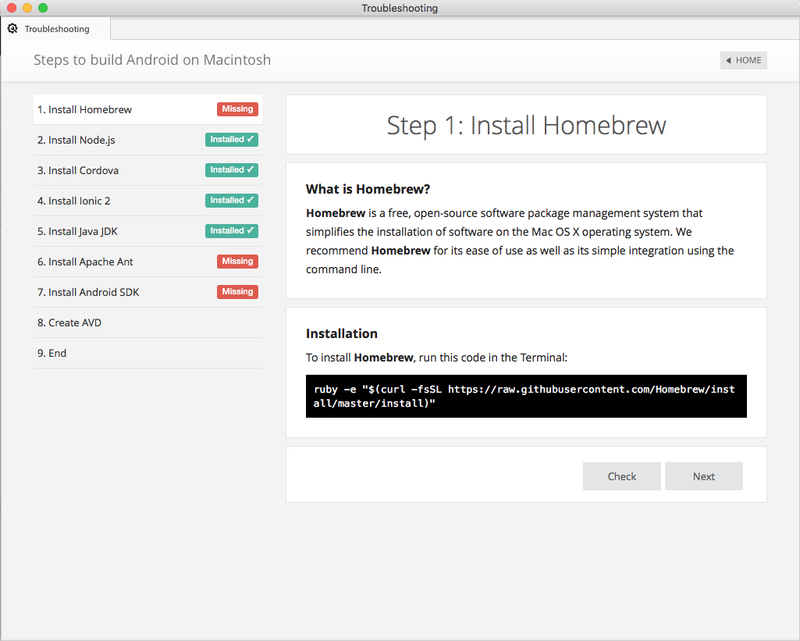 Here you can see that Homebrew, Apache and Android SDK are missing. 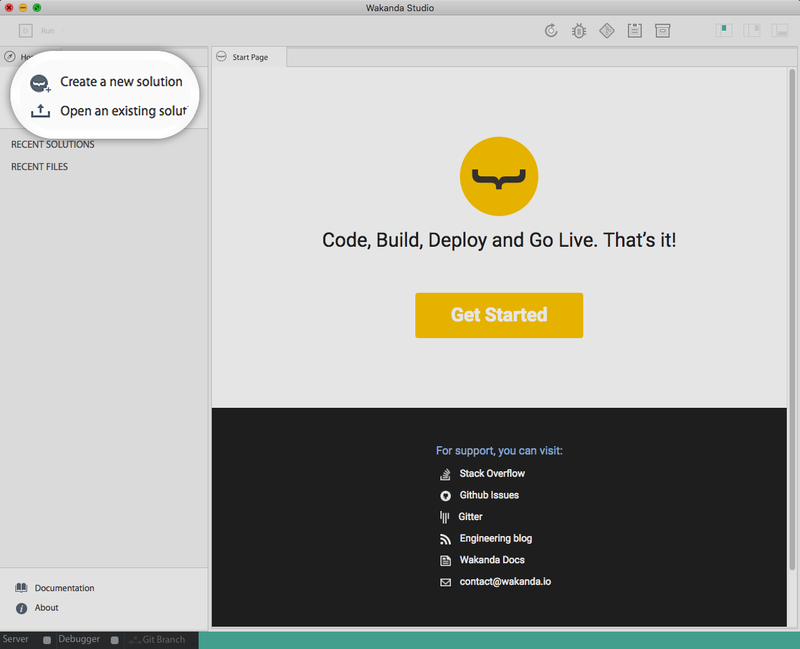 Everything is explained there: why I need them, and how to install them. 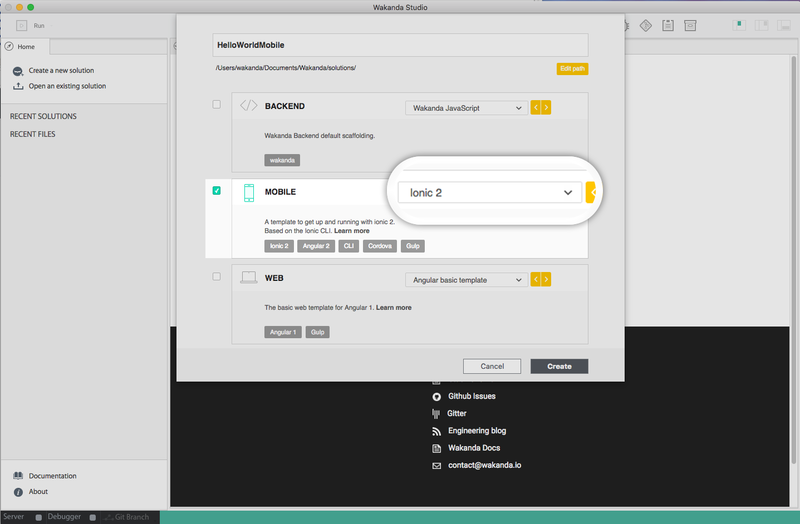 Once all your dependencies are checked you can preview your app. 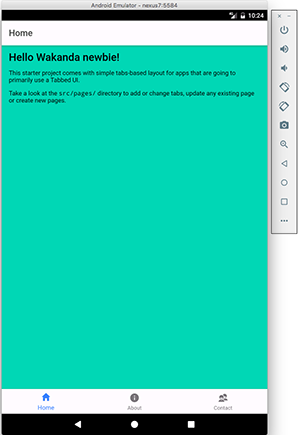 Just click on your project, and then on “Run”. In themobilefolder, srcis the classical ionic2 project’s structure. You can split your screen, and moove tabs to make it easier to work with. 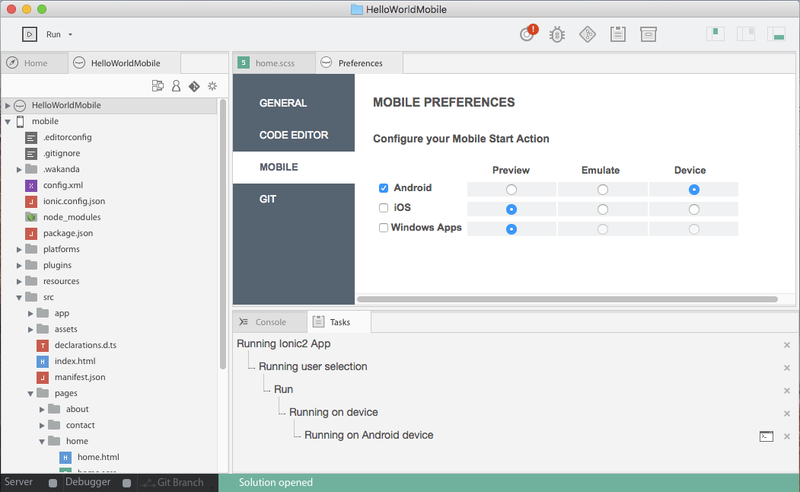 Now you can run your app on the Android emulator. 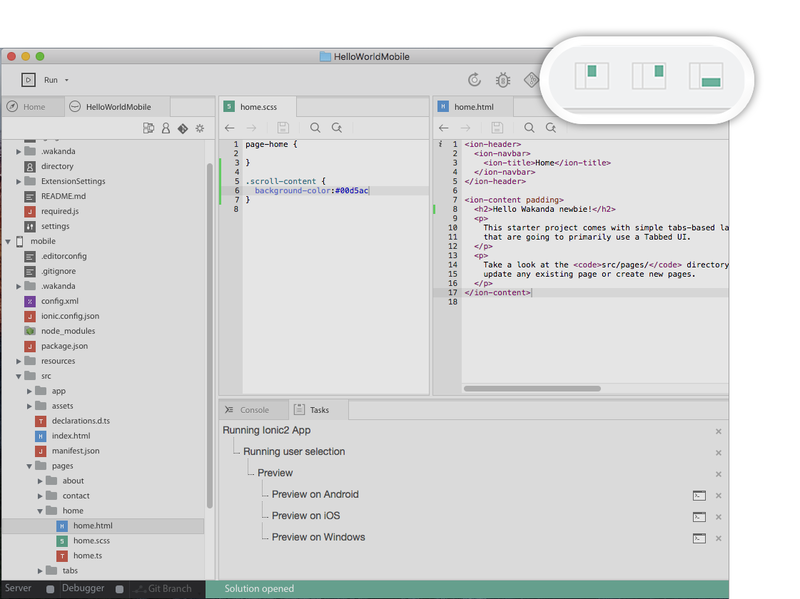 In Run dropdown, go in mobile preferences, select Emulate, for Android. Wakanda Studio automatically detects supported device when connected to the USB port. 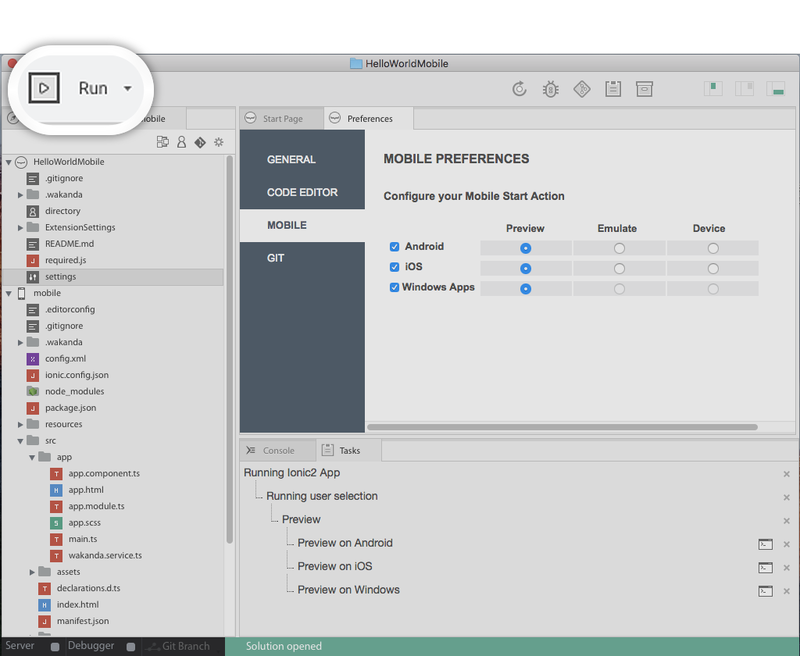 In Run dropdown, go in mobile preferences, select Device, for Android.